When Lola got home from school Tuesday, she proceeded to have a melt down because she only had five dollars in change. Who can understand a five year old brain? The pronunciation of this fact was immediately followed by an onslaught of tears because as she noted, she needed more money to buy herself something at the American Girl Doll Store. I quickly informed her that no matter the money, we would NOT be making a trip to that store that day. Some days I wonder if we should ever go back. First. World. Problems. Try to convey that message to a hysterical 5 year old. I’ve heard it said, it’s like arguing with a drunk. So I walked away. If it would have been later in the day, I would have told her to sleep it off. The real reason for the meltdown came out. Her little brother received a small toy from that morning. And she didn’t. Among the many reasons Lola noted as to why her baby brother gets stuff and she doesn’t is that he’s cute. Her words in no particular order: he’s cuter than me, everyone thinks he’s cute, you only like him, no one thinks I’m cute, everyone pays attention to him, it’s not fair, it’s not fair, it’s not fair. I get it. He’s cute. So is she. But yet the very nature of this baby stage makes him the prime target for overwhelming and constant affirmations of cuteness from the following groups of people: grandparents, aunts, uncles, cousins, cousins, people dating our cousins, our friends, Lola’s friends, young and old – i.e. – toddlers, elementary age children, pre-schoolers, elderly, complete strangers, singles, married, dating, etc., Lola herself, us, have I mentioned complete strangers? Seriously, I can’t leave that kid alone for two seconds. I once saw an elderly lady squeeze his chubster thighs when I turned my back at the grocery store. He just smiled. I mean of course the baby is going to get more attention. At its most basic level, he’s not self sufficient, so there’s that. Some days I want to assure my 5-year-old that if the baby could walk, feed and change himself then I wouldn’t give him nearly as much attention. Somehow I don’t think that line of reasoning would change how Lola sees things. She’s a conflicted five year old. 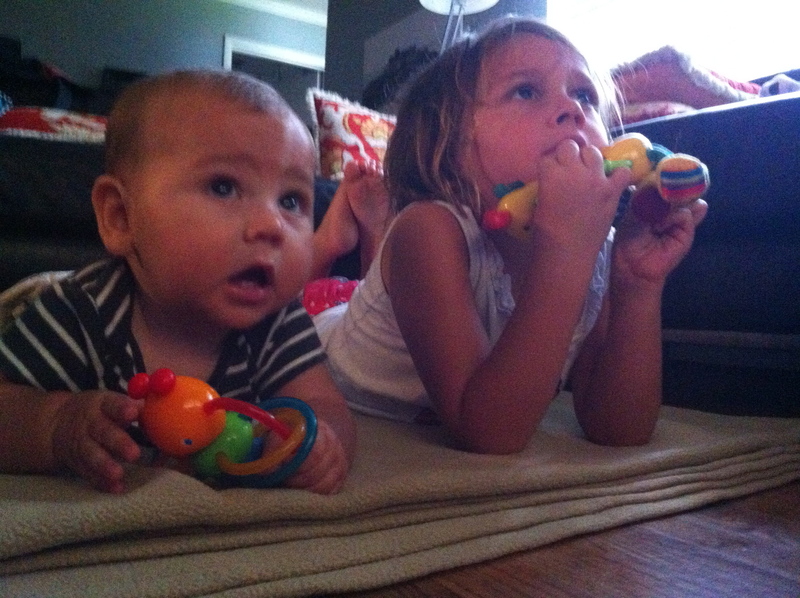 Lola loves her baby brother immensely and yet struggles with the attention thrown his away. In the midst of this tantrum was a pause followed by loving remarks, hugs and kisses for her brother. “You are so cute. I love you Eli. You are so cute. I would be so sad if you weren’t here.” Conflicted at such an early age. Depending on how things play out in the teenage years, this would be the part in the novel of her life that would be considered foreshadowing. Difficult times may await you in the future given the early conflict you are facing. So the thing was that she wanted something too. You know, because it’s not fair that her little brother should get a rattle and she get nothing. A small part (oh ok, a large part) wanted to go out and buy her the exact rattle “in the interest of fairness”. Despite the sheer brilliance of this plan, I’ve found that those “lessons” I so badly want to teach/rub in her face often backfire on me. I refrained from the cruelty of showing what true fairness can mean. When the I hate you, you’re the meanest, no one loves me, everyone loves Eli, everyone thinks he’s cute, no one thinks I’m cute, I’m a big money poop (she’s creative in her name calling, but I try not to encourage it) finally stopped, we gave her the option of earning some extra money. Nothing like a little bit of sweat to mix in with your tears. She swept, pulled weeds, picked up leaves, moved rocks and bricks and picked up dog poop. That’s right, when all else fails in parenting, hard and possibly stinky labor is totally the way to go. Tears were gone, replaced with a curiosity for what exactly was in the dog poop because it didn’t really look like poop at all. In other news, our dog, Hemingway will eat almost anything as evidenced by his poop. This entry was posted in Because it's funny, Life, Parenting: AKA - I Don't Know Any More Than You Do and tagged American Girl Doll, Conflict, Fair, Five Year Old Life, Foreshadowing, Jealousy, Parenting, Parenting Lessons. Bookmark the permalink.